A manuscript book specifically designed for guitar, mandolin, banjo, or any tab notation, with 40 pages of 5 special dual stave systems for writing both notation and tablature. This book with perforated pages is printed in black ink on regular-weight, white paper. 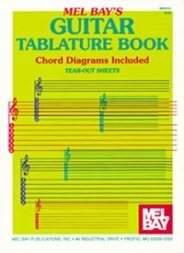 Includes 2 pages of chord diagrams, 3 pages of blank chord grids, along with instruction on how to read tablature and basic information on major and minor scales. 8.75 x 11.75.